St. Anthony was born in 1502 in Cremona, Italy. He became a medical doctor. In 1528 he was ordained a Priest, and cofounded the Barnabites, the Religious Congregation called this because it was headquarted in St. Baarnabas Monastery in Milan. The Barnabites occupied the Monaster in 1538, having been approved in 1533. While he was still an infant his faither died, leaving his mother to care for him. His mother worked hard to teach him compassion for the poor and the value of suffering. After completing the studies given in the shools at Cremona, he was sent to Padua for his philosphy, and in 1520, when he had finished his studies, he began the study of medicine. He received his degree of Doctor of Medicine at the age of 22, and returned to Cremona to open his practice. Three years later, he began to study theology and received his Holy Orders in 1528. St. Anthony devoted himself to works of charity and mercy as he visited and consoled the sick in hospitals and prisons. Producing such great fruits with his ministry of preaching and administering the Sacraments, he sought out a much larger field for his work, which was for the betterment of souls. He went to Milan, and entered the Confraternity of Eternal Wisdom. He told his superiors of his idea of founding a congregation of secular clergy. Frequent wars in Italy had devasted the country. Famine followed in the tracks of the soldiers and the growth of Lutheranism and their contempt for everything Catholic had spread throughout the country. He started the “Regular Clerks of St. Paul” with five members, and it was canonically sanctioned by Pope Clement VII in 1533. Their rule bound them to “regenerate and revive the love of the Divine worship, and a truly Christian way of life by frequent preaching and the faithful administration of the Sacraments”. He was noted for starting the devotion to the “Forty Hours”. Worn out by his voluntary penances, as well as his endless labors of charity, he was attacked by fever during one of his missions. Knowing that his illness was his last, he had himself brought to his Mother’s house in Cremona. He received the last Sacraments and peacfully expired at the age of thirty-seven while at his mothers. His body was found incorrupt 27 years after his death, and he was canonized by Pope Leo XIII. Saint Anthony died at the age of 37, worn out by being of service to others. He not only used his talents in performing charity for the poor, but also became a Priest so he could administer the Sacraments to those he served. He started a Congregation and inspired others to help the poor, and to revitalize the faith in Italy after Luther had started his protestant faith. In studying his life we see that he died at the age of 37, but the amount of goodness that this saint accomplished before his death, surpasses many that live to be 100. He shows us that by having a good prayer life, strong faith, and regular reception of the Sacraments, we too, can achieve sainthood. 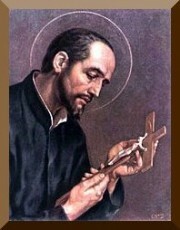 Let us ask St. Anthony Mary Zaccaria for his intercession to help us in all that we do to build up the kingdom of God. He truly is a great saint of the Church that is rightly celebrated on the Liturgical Calendar.